Make school lunches healthy and fun for your kids with these convenient store-bought snacks. Kids love their great taste and moms feel good about giving these healthier and nutritious snacks to their kids. I can’t believe there are only 3 weeks left of summer holidays for the kids here in Ontario. My youngest starts kindergarten this year, so it’s going to be a big change for me. Also, packing two lunches every morning and trying to please two different taste preferences is something new for me. Packing school lunches can be challenging as a parent because you have to make sure you’re packing food that is school-allergy safe, nutritious, won’t spoil without refrigeration, and enjoyable enough that your kids will eat it on their own (because you’re not going to be there to make sure they finish their food). 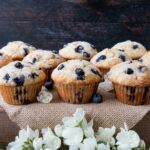 My kids and I have had a chance to try some delicious and healthy snacks over the summer. I’ll be honest, I can be quite the skeptic when it comes to healthy foods, and to my surprise, all of the following snacks are amazing! They are tasty enough for even the pickiest eaters like my kids, and for skeptics like me. 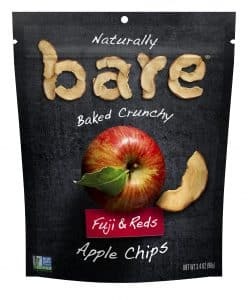 Bare Fuji & Reds Apple Chips | Kids will enjoy crunching away on these delightfully (and naturally) sweet apple chips, while mom can rest assured knowing there is only one ingredient: apples! My youngest has a sweet tooth and loves crunchy foods, so these chips were absolutely perfect for him. I like snacking on these apple chips as well because I can enjoy them without any guilt. Snikiddy Cheese Puffs Sharing Packs | Happy meets tasty with these cheesy puffs! This better-for-you snack is packed with flavor, but free from the nasty preservatives and additives that inundate other snack foods. 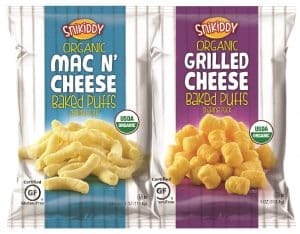 With two kid-inspired flavors to choose from, Grilled Cheese and Mac n’ Cheese, these are sure to be a lunchbox hit! These cheese puffs were both my boys’ favorite out of all the snacks we tried. They kept asking for more and before I knew it the bag was almost empty. I was pleased that these baked cheese puffs had no food coloring in them and that they were not too salty. As much as my boys like the Cheetoz brand cheese puffs, I never liked giving those to them because of all the added food coloring and the high salt level. These Snikiddy are definitely mom-approved and kid-approved! 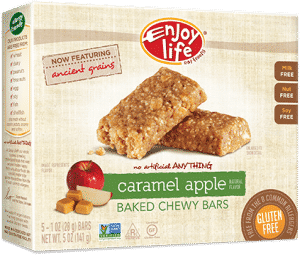 Enjoy Life Foods Baked Chewy Bars | Free from the eight most common allergens, including dairy, gluten, and soy, these flavorful bars offer a quick and nutritious energy boost for even the most sensitive of eaters. 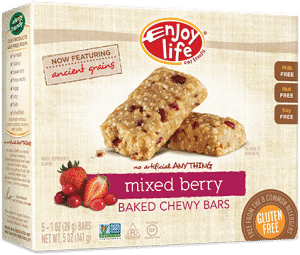 These delicious chewy bars come in great flavors like mixed berry, caramel apple, cocoa loco, lemon blueberry and even carrot cake! Good Health Eat Your Vegetables Chips | These veggie-packed chips boast an array of 8 Great Vegetables, including kale and broccoli, though your kids’ taste buds wouldn’t know it! 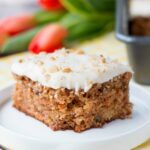 Sneakily loaded with ample vitamins, mom can rest easy while the kids can feel satisfied and fueled for the busy school days ahead. I loved all the flavors these vegetable chips came in. There is something to suit every taste. My favorite was the sour cream & onions. The taste was very similar to Pringles chips, but so much healthier for you. 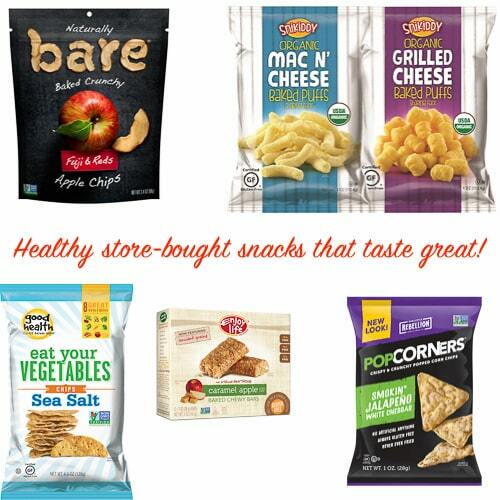 PopCorners | From sweet to savory, PopCorners has 7 kid-friendly flavors in convenient grab-and-snack packaging filled with tasty popped chips free of gluten and GMOs, but not free of flavor! So fuel your day with these healthy, scrumptious and convenient treats that are perfect for school lunches and for snacking any time of day.